We are the Pirate Badgers Football Club. P.B.F.C. is one of the 8 teams in the PowerHaus League of Illinois. The team currently consists of 12 members of the Gibault Catholic Highschool in Waterloo, IL. The Pirate Badgers are now entering their second season as part of the PowerHaus League. We are currently engaged in a huge rivalry against Pikachoi United. 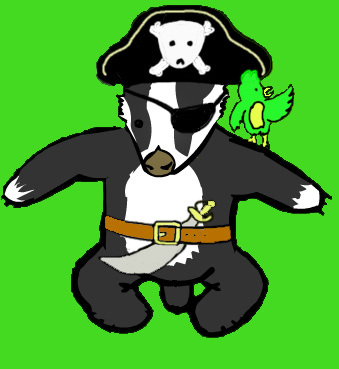 We completed last season with a stunning 0-9-2 record, but hope to relinquish our embarassment this season and regain the Pirate Badger pride and dominance. Pirate Badgers are are an easy-going team, that becomes very hostile when provoked in a match. Pirate Badgers love to fight, and especially during the middle of a soccer match. Pirate Badgers laugh in the face of red cards, and spit at referees. Pirate Badgers are not concerned with rules or regulations, and always, always in their mind win the match, regardless of the outcome. August 28, 2008 - Pirate Badgers set preseason game with rival Pikachoi United. Game is set for S.P.P.S fields on Saturday August 29 at 3:30 P.M.